At FutureCow® we know the success of your farm depends on the health and well-being of your herd. We engineer reliable products to help make your farm more efficient and profitable – all with the utmost consideration for animal comfort. FutureCow’s Teatscrubber provides an extremely effective and consistent process to wash, disinfect, dry, and stimulate the dairy cow’s teats prior to milking. Available for large, medium and small dairy farms with any type of parlor. 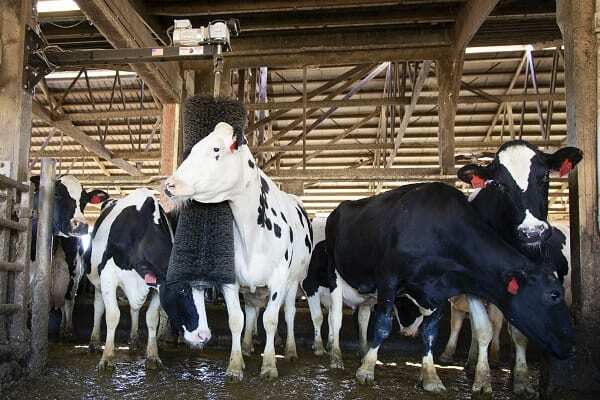 FutureCow’s ComfortBrush products are designed to groom and stimulate your animals, creating a happier, healthier, and more productive environment. Brushes are available in cow, calf, cattle and goat sizes. Our new Stationary Brush is ideal for pastures, lots and barns with no electrical access. Just like our rotating option, it is perfect for keeping your cows clean and happy. Our mission is to build maintenance-free products for your farm that you can rely on. This promise is the cornerstone of our manufacturing process and our commitment to customer service. We offer state-of-the-art equipment that never sacrifices the comfort and humane treatment of your animals. And we back everything with our FutureCow 100% satisfaction guarantee. We bring our ComfortBrush and Teatscrubber to trade shows around the world so that you can interact with our products. We hope to see you at a show soon! FutureCow’s ComfortBrush will be on display in the Agri-Plastics / Agri-Comfort booth located in Hall 1, Booth 44E. For more information please contact us at [email protected] or call us at 407-571-2060.